A smile makeover is the process of transforming a patient’s smile through a combination of Cosmetic Dentistry and Restorative Dentistry. To achieve an ideal smile that looks and feels natural, Morgan & Haupt Dentistry takes your entire facial appearance into consideration including your skin tone, hair color, lips, tooth display and gums. You may choose to have a smile makeover for purely cosmetic reasons, or it may be required to correct health and functional concerns. 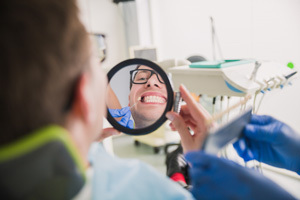 Several dental procedures can be used in the process, including: Veneers, Dental Fillings (composite bonding, inlays or onlays), Dental Crowns, Teeth Whitening and Dental Implants. What cosmetic dental issues does a Smile Makeover address? Discolored or Stained Teeth: Due to certain foods and beverages as well as tobacco use, medications, trauma and age. Explore the options available in Cosmetic Dentistry. Broken or Chipped Teeth: Due to an accident or as the result of wear. Small chips can be corrected with composite bonding, inlays or onlays. Larger chips and broken teeth may require Veneers or Dental Crowns. Severely damaged teeth may need to be removed and replaced with a Dental Implant. Gaps or Spaces Between Teeth: Embarrassing gaps or spaces between teeth can be easily addressed during a smile makeover. For small corrections, see Dental Fillings (composite bonding, inlays or onlays); For larger corrections, see Veneers or Dental Crowns. Alignment issues: For alignment issues, see Invisalign® solution to straighten teeth and bring them closer together. Missing Teeth: It’s important to replace missing teeth as quickly as possible to avoid serious long-term consequences. There are a number of excellent options for replacing missing teeth including Dental Implants, Dental Bridges and Dentures. Create Fuller Lips or Correct Gummy Smile: Teeth also serve as supports for your lips. Your dentist can make improvements that help better support your lips, making them appear fuller. Small teeth can be lengthened/enlarged using porcelain restorations such as Veneers to correct the gum to tooth ratio.